The accelerometer, while not everyone’s favored method of controlling cars in Real Racing (primarily because it looks strange on the subway) could have many other uses besides iOS gaming – at least if the tweaksters have their way! 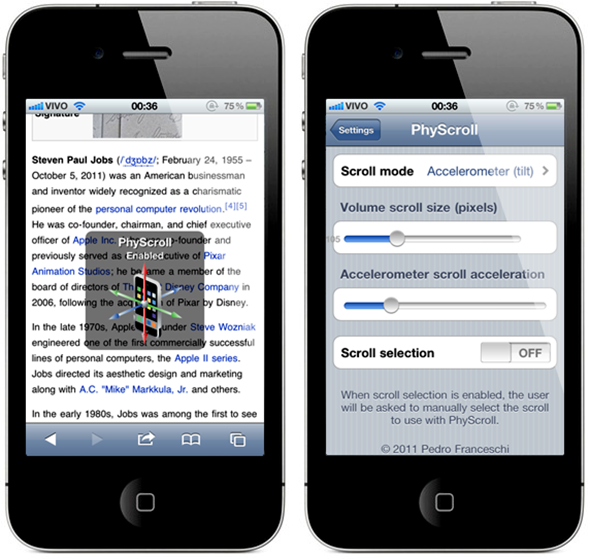 Cydia developer pH has created a nifty little package called PhyScroll which allows iPhone, iPad and iPod touch users to utilize their device’s accelerometer for other tasks such as browsing and scrolling. Whilst sliding a finger up and down a screen isn’t exactly what you’d call taxing, being able to move up and down by tilting back and forth does make things even easier, and a bit charismatic in public too. In addition to the accelerometer, the volume buttons can also be used to scroll, although to us, that seems more like a side-feature, and something which might give your volume buttons a hard time. Both work in any app which allows scrolling to take place, and for $1.99, it’s not too pricey; in fact, it’s good value. Does mean, though, that you’ll wind up with repetitive strain injuries in your wrist as opposed to your finger! As a plus, it works on both iOS 4 and the more recent iOS 5 firmware, so those of you hanging on to your untethered jailbreaks won’t have to miss out on a great tweak – as is increasingly becoming the case. You also will need to be on a jailbroken iOS if you wish to install PhyScroll. For jailbreaking iOS 5 tethered using Redsn0w, you can follow our complete step by step guide posted here, or here if you want to use Sn0wbreeze on Windows. Since jailbreak on iOS 5 is currently limited to tethered boot only, you can install ‘SemiTether’ patch (instructions here) from Cydia to make your jailbreak semi-tethered on iOS 5. For those of you on iOS 5.0.1 can follow our instructions posted here on how to jailbreak using Redsn0w or here using Sn0wbreeze. Although some might be partial to the functionality of this tweak but it’s a great way to show off your precious iPhone’s capabilities.